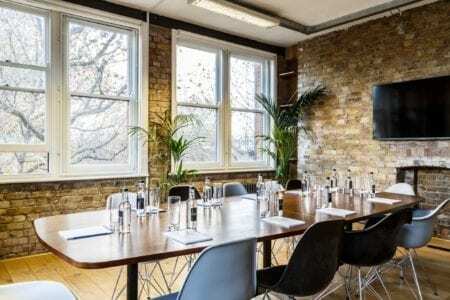 With this in mind, we have scoured London for ideas and have come up with some of our favourite cool London meeting rooms that are guaranteed to make your next event a resounding success. This is a private members club with some amazing spaces available for hire. The Green Room has it’s own small terrace and can accommodate 80 seated, 150 standing, whilst the Park Room with it’s bare brick walls, flooded with daylight, makes the perfect room for brain-storming meetings or small receptions. During the day, light pours in through tall windows, by night grand chandeliers spread a soft light across the rooms. With the capacity for events for anything from 5 to 250, you can be sure to find a room to suit your meeting or event. The courtyard gardens offer endless possibilities for evening entertaining. 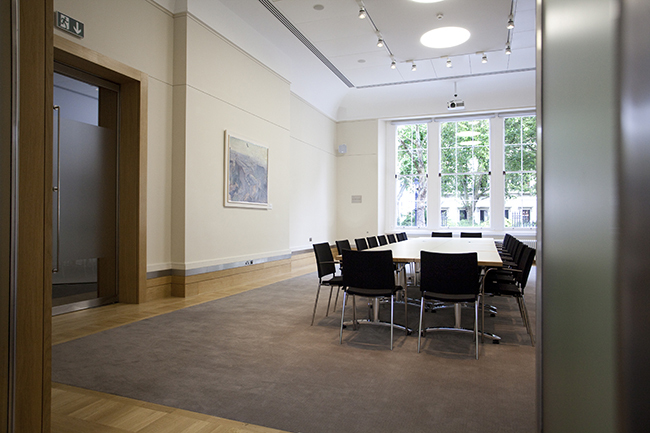 Another private member’s club – One Alfred Place, has a light, airy and contemporary atmosphere. There are 8 unique spaces for hire here, ranging from a large lounge with colourful soft furnishings, suitable for theatre-style presentations, speaker events, product launches and networking parties with a capacity of 20-100 seated, 110 standing, to boardrooms with a capacity of 16, suitable for board meetings, brainstorming and private dining. 110 Rochester Row, a relatively new kid on the block, has flexible meeting spaces suitable for meetings, product launches, brain storming, conferences and networking. Capacities here range from 16-60 boardroom to 100-120 theatre style or dining. Definitely worth a look. This does exactly what it says on the tin! Nestled in the eaves of a listed building in Bloomsbury, the owners have created some bright, airy and modern spaces suitable for creative meetings, training sessions and workshops. Capacities are from 16-80. This venue provides a unique atmosphere for meetings, presentations and much more. Vaulted brick ceilings and parquet floors set the scene perfectly in this beautiful old church. Perfect for meetings and conferences, capacities in the various rooms range from 12 to 300 seated, 100-300 standing. Just 10 mins from Hammersmith, here you will find a tranquil haven for your next meeting. Rooms vary in size and can accommodate any number from 22-150 seated. Stunning views will ensure that creative juices start flowing from the moment your delegates arrive. What’s more, by holding your event here, you will be directly contributing to the WWT’s global conservation work. Here is a very unusual venue. Predominantly this is a venue where you can play ping pong, but the main hall can seat up to 200 delegates with a 10ft cinematic screen with HD projector and a state of the art wireless presentation system. Perfect for conferences, you can then stay on for some teambuilding ping pong afterwards. If historic grandeur is more your thing, then Prince Philip House at 3 Carlton Terrace is an impressive venue. Grace and sophistication are combined to provide the perfect event – anything can be held here, from awards ceremonies, product launches, private dinners, press conferences, film shoots, team building and drinks receptions. Capacities are 28-160 seated, 70-200 standing. This is an altogether different venue – a unique turn of the century warehouse by the Grand Union Canal. Can be either hired as a blank canvas venue or as fully serviced. Set over three floors, the space is equally suited to off-site meetings and conferences as to product launches, exhibitions and private functions. There is also a fully enclosed exterior courtyard which can be used for team building, filming or other outdoor activities.